Autumn Sedum "Joy" covered in snow was the inspiration for my calling them snowflowers. You don't know about snowflowers? That's okay because they only "grow" in my hillside garden when it becomes magical after a good snow fall. If you've ever walked through a garden after a snow, you will see trees, shrubs and flower beds transformed by ice and snow hanging onto the remnants of blooming flowers and stems. I deliberately leave my flower stems uncut so birds can enjoy the seeds in winter. After seeing them covered in snow, I now say I leave them uncut so that I can also find more snowflowers. A border of mums turns into a white snow-covered hedge of small snowflowers. After a good snowfall, I like to walk through my garden and try to recall what plant is sitting under the blanket of snow. Sometimes it's easy to spot the original plant, like the Autumn Sedum "Joy" that transforms itself every season. In spring, it's low to the ground sprouting in the shape of rosettes. By summer, it's a 2-foot succulent plant with pink flowers. By fall, the pink flowers have dried and turned a burnt orange, providing the perfect landing spot for snow to stick and become white caps on the orange base. 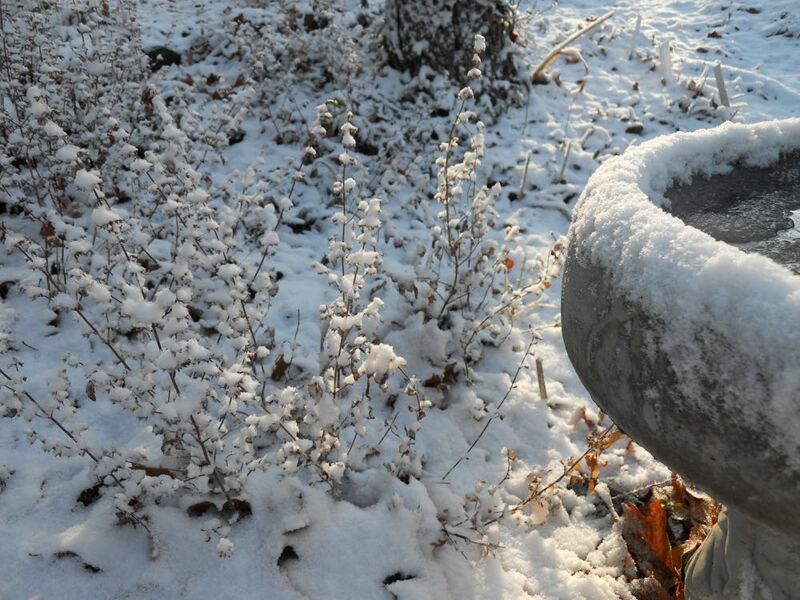 These mint plants alter entirely once covered in a sprinkling of snow. Sometimes I don't know what the original plant was, like these perennial mints that take on a whole new look once covered in snow. I know they are a mint because the stems are square and hollow but I haven't made much progress in terms of identifying what kind of mint. I live in USDA's hardiness zone 5b, which is North America's gardening belt. We had a parched fall so the snowfall is a welcome sight to help replenish the water tables and hopefully end the fall drought. One more snowflower, this one on still-green leaves of my white tree rose. Love the pop of green peeking out from under the white tops, the tree rose looks like it still has white flowers. One of my white tree roses covered in snow. This one kept its leaves even after the first snowfall. Snow changes my whole garden. I look forward the morning sunshine after a snowfall, the whole landscape changes. The front of my garden covered in snow. When the sun shines, the garden is magical! Another advantage of having a snowy garden, with snowflowers there is no watering or weeding required.